Family Office Recruitment Services (Printable PDF Brochure): We are one of the only family office recruiting and executive search firms globally that exclusively focuses on working with single and multi-family offices. 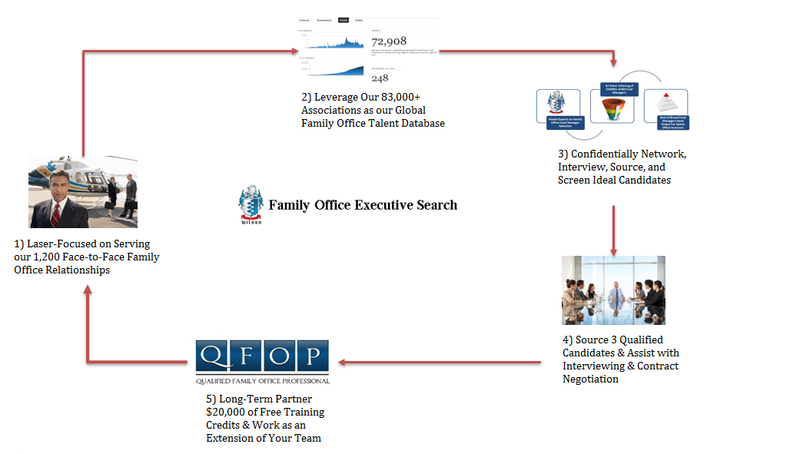 The advantage of working with Family Office Executive Search is that we have the largest database of talent in the industry, with over 83,000 professionals in our Family Offices Club association, a for-profit trade industry group that we operate we have access to 1,000′s of single family offices and even more multi-family offices. We also operate PrivateEquity.com, FamilyOffices.com and have a total of over 1.5 million registered professionals in our database. Un-Matched Face-to-Face Relationships: We have met with over 1,200 family offices face-to-face in over 15 countries, and we have hosted 52 conferences and workshops in the industry. Through our data research, bestselling book on family offices, leading podcast, quarterly family office training workshops, live webinars, training platform, and great brand recognition we have a marked advantage both in reach and understanding. The diagram to the right is the process that our 13 person team uses to complete thorough and confidential executive search mandates for family offices globally. Unique Alignment Model: We offer our clients a per month fee for successful placements. This fee ranges from $475/month-$999/month depending on the salary of the employees, and typically works out to .8%, less than 1% per month. In this way anyone who we bring on to your team who leaves in less than 36 months we will get paid less than industry standard compensation, and anyone who stays on longer was a good hire and we get paid more when that happens. This removes the risk of you paying a full search fee for those who leave after 10-20 months of employment. Unlike many of our competitors, we not only drive the recruitment process, but are also involved at every stage of the search, from the initial approach, to successful placement. This ensures a professional, clear and seamless process for both client and candidate. Our reputation is crucial to our success, therefore we strive for excellence in the service we provide and in the people we employ. We will always maintain the highest ethical standards, incorporating integrity, honesty and professionalism in everything we do. To engage us to help you build out your team please see our Printable PDF Brochure or email Terry@FamilyOfficeJobs.com. © Copyright 2007-2018 by Family Office Executive Search & Family Office Club. All Rights Reserved.